National bus and coach builder Alexander Dennis Ltd. has been fined after it ignored multiple warnings about dangers to its workers' health from overuse of hand-held power tools. Sheffield Crown Court heard this week that nine workers at Plaxton's, an Alexander Dennis after sales, repair and refurbishment depot in North Anston, Rotherham, were diagnosed with a permanent debilitating condition known as hand-arm vibration syndrome (HAVS). For several years, the Edinburgh-based company persistently failed to heed expert advice, specialist reports and complaints from workers of pain, discomfort, numbness and whiteness in their fingers. 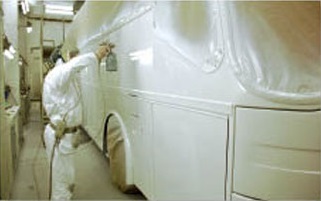 The Health and Safety Executive (HSE) found there was uncontrolled exposure to hand-arm transmitted vibration in the case of up to 25 staff in the Plaxton motor vehicle repair workshops in Ryton Road. There were no restrictions on the type of hand-held power tools employees used or the length of time they were allowed to operate them. In addition Alexander Dennis Ltd had no system to replace those tools that were old or worn out – one tool was 28 years' old and a lack of maintenance meant tools were not running at the optimum level to minimise vibration. Workers were not provided with any information or instruction on how to minimise the risk from vibration and there was no health surveillance programme to check for early signs of HAVS among the workforce. Since HSE's intervention, the company has taken action to assess the risk to their employees, provide better quality tools which are regularly maintained, train employees on how to protect themselves and provide regular health checks to pick up early signs of the disease. Alexander Dennis Ltd, trading as Plaxton of North Anston, was fined £100,000 and ordered to pay £18,643 in costs after pleading guilty to breaching Section 2(1) of the Health and Safety at Work etc Act 1974. The judge described the company's failings as inexplicable and highly culpable in their failure to follow the advice and the warnings given. HSE inspector Christine Mellor, said: "Alexander Dennis continually ignored their employees’ symptoms which showed they were suffering from the effects of vibration caused by the extensive use of a variety of hand-held power tools – sanders, drills, grinders etc. It failed to heed recommendations from consultants they had engaged to assist in managing the health risks to employees, including the advice from occupational health professionals. "At the same time, the company was fully aware that successful civil claims had been brought by employees. Despite all this, Alexander Dennis continued to expose employees to an uncontrolled risk."